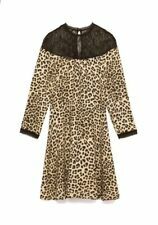 NWT ZARA Woman Animal Print Skater Black Gold Dress Sz S.
ZARA DRESS WITH SHIRT COLLAR AND LONG SLEEVES.FEATURES A SEAM AT THE WAIST,A RELAXED A LINE SILHOUETTE AND BUTTON UP FASTENING IN THE FRONT. It has a small mark on the right shoulder. Gorgeous dress by Zara. Size L fits a 10-12. Ladies sheer burgundy embellished skater dress from Zara. UK size 12 (M). Length - Approx 32”. Zara Eyelet Gathered Printed Dress In A Size M, Would Fit UK Sizes 10/12. FLORAL SLEEVELESS SKATER DRESS. ARMPIT TO ARMPIT 17.5" WAIST 29" LENGTH 33". ZARA - Eyelet Gathered Printed Dress - Size M <> Was: £49.99 - Now: £19.99! !